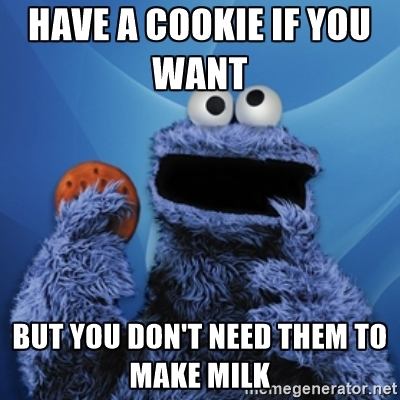 The trouble with lactation-inducing cookies and other recipes is that they seem so easy! Eat this small, tasty thing and BAM! You’ll have more milk! You can buy them easily – you can even make them! Heck, some professionals will even sell them to you! What’s not to love about lactation cookies? But generally I don’t think they’re an appropriate solution, and it looks like I’m not the only one. When one mum posts in a breastfeeding support forum and asks for lactation recipes, she’ll generally receive two types of responses. The first type will be eager mums who are happy to be helpful, sharing their favourite milk-boosting foods – cookies, smoothies, oats, beer and five hundred different ways to have milo. The second types, however, are more hesitant and probing. Why do you think you need to make more milk? How many wet nappies is your baby having each day? How many dirty ones? Is your baby alert and meeting milestones? Tell us more. Tell us what’s happening so we can help you better. She doesn’t want to give you recipes, because she thinks you might not need them. Basically these mums want to help you find a better solution than cookies. A BETTER SOLUTION THAN COOKIES? WHAT? WHAT IS THIS SORCERY?! Nope, it’s actually true. There are better solutions. You can ring the Australian Breastfeeding Association. You can speak to an IBCLC. You can work out if you have a supply issue, a perceived supply issue, or if the problem is in fact with your baby’s ability to breastfeed rather than your ability to make milk. But just in case you aren’t on the bandwagon with me, here’s seven more reasons why you should reconsider the cookies. Taking lactation cookies for a genuine breastfeeding problem, to me, is akin to discovering an unexplained festering wound on your body and simply throwing a band aid over it, without questioning why it’s there or how to get rid of it. Cookies can seem like a harmless way to boost a mum’s confidence. I actually feel like they do the opposite – they perpetuate the idea that our bodies can’t make enough milk to sustain our babies on their own. We would never have evolved as a species if that were the case! No one ever questions their body’s ability to make blood, unless there is an unusual medical condition involved. We need to start thinking about breastmilk in the same way – we were made to breastfeed. I have been a breastfeeding counsellor for 25 years … the first 20 without location cookies even being a thing! I still managed to help mums work out what was happening and get their babies breastfeeding. I wish Tim Tams were weight loss biscuit but I believe that as much as I believe Maltesers increase lactation.